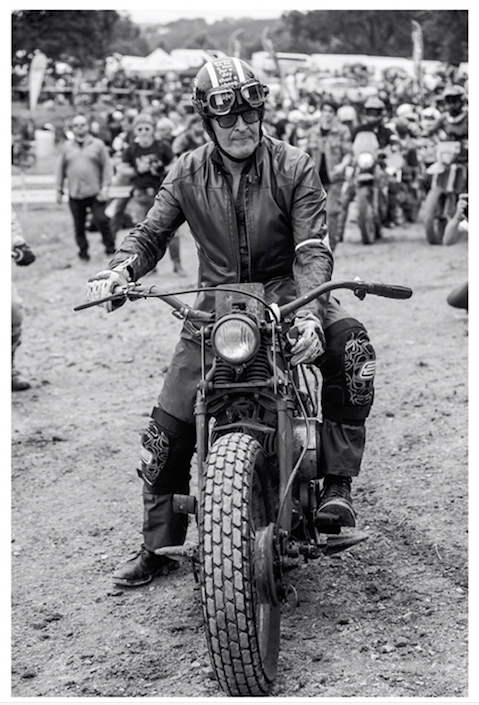 Back in late 2017 we highlighted some motorcycle photography from Los Angeles-based photographer, Heidi Zumbrun. 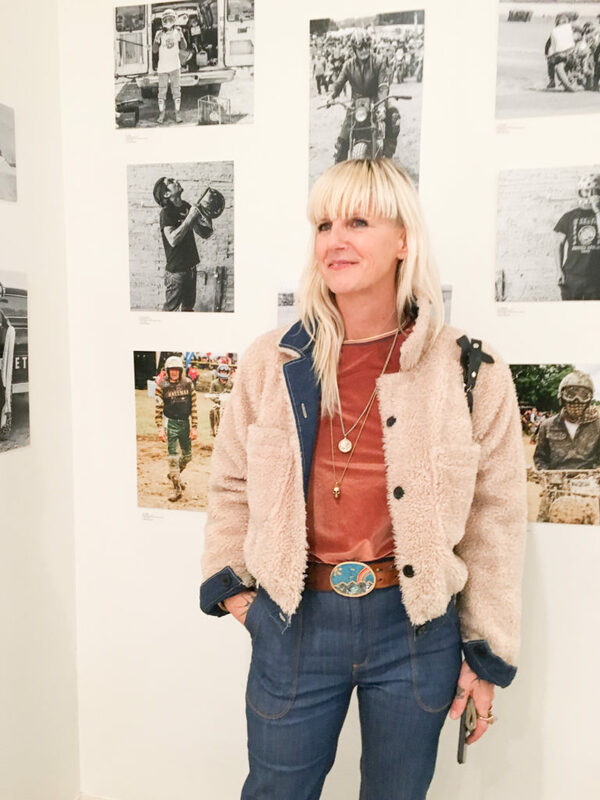 Now, after another year of traveling the world and photographing motorcycle, surf, and skate culture, Heidi is back with a new gallery exhibition. Held at the Lair Gallery in West Hollywood’s Tesse Cafe at Fred Segal, this recent exhibit was curated by Stacie B London and showcased a body of work focusing on and celebrating the unique culture and energy of the motorcycle and surf community. 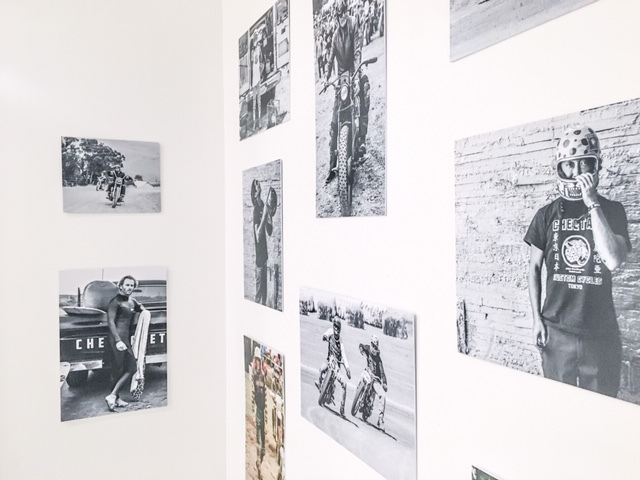 Upon the exhibition wrapping up, we spoke with the woman behind the photos about her latest show and delved into the challenges of capturing motorcycling in photography, what exactly it is that sparks her interest in these cultures, and what she’s trying to capture behind the camera. For anyone unfamiliar with you or your work, can you tell us a little about your background with photography and motorcycling? “Sure: I’ve been riding a motorcycle for 20-plus-years, I have an MFA in photography & I’ve been taking pictures since I was 16. Luckily along the way my lifestyle and my photography work have merged…. 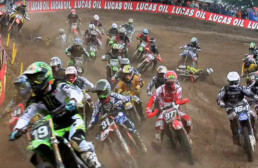 What parallels do you see between surf and moto? Well, riding waves, riding roads – there’s an immediate parallel right there. Holding your line on an open road or riding down the line surfing a wave in the open ocean -I think there’s a sense of freedom in both & they tend to attract very like minded passionate people who love the outdoors, motion and speed. Can you tell us about the recent show? 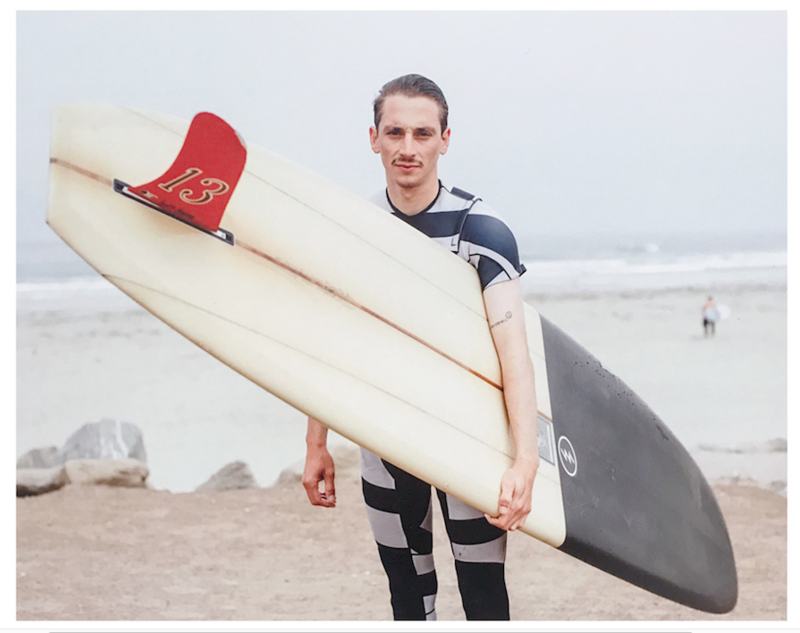 This particular exhibit was curated by Stacie B. London and it’s a culmination of the last year or so of my photographs documenting friends, racers & local riders in the motorcycle and surf community. 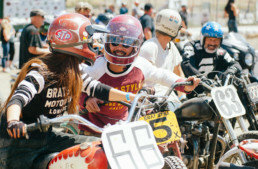 The selection of images are from a body of work that I’ve been showing throughout the year- primarily images from the Mexilog Festival -a longboarding, single-fin festival in Mexico – Hell on Wheels -a local vintage dirt bike racing club here in Los Angeles, & the Wheels and Waves festival in France and California. What is it that you’re trying to capture or convey in your photography? I’m trying to capture, at least in this body of work, the people in my community. 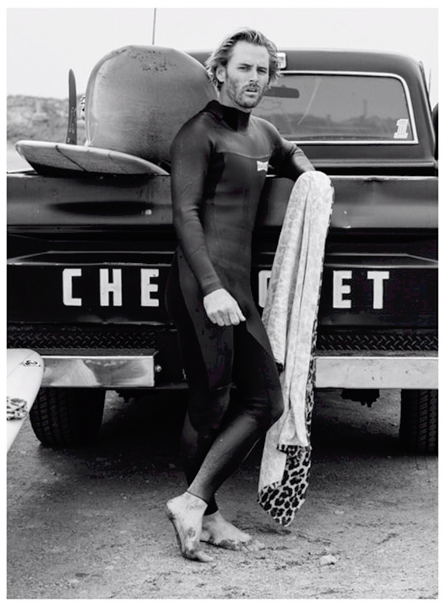 The people in the moto and surf culture, my culture, fascinate me- as does the history and the craft of building motorcycles and surfboards and the riders relationship with them. I definitely lean towards a vintage aesthetic and I love longboarding, single-fins, vintage motorcycles, and the vintage bike scene. 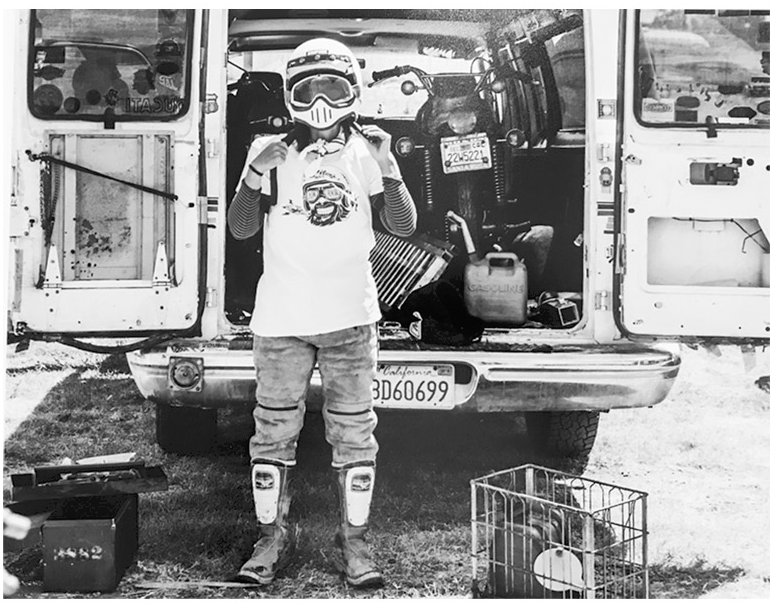 I’m trying to document the people that make up this community who are doing incredible things- whether it’s racing or competing, building bikes or shaping boards. I really want to tell their stories. Do you see yourself as having a particular style? Do you have a favorite piece from the recent exhibition? What’s the hardest thing to convey about bikes from behind the lens of a camera?